I was recently in a discussion online with a group of creatives, where the topic of interviews came up. The basis of the question was, is it ever OK to ‘cheat’ a little bit in order to get an interview or be hired. By this they meant, exaggerate accomplishments, etc. As you might imagine, the discussion was quite lively, but the consensus among professionals was that you never exaggerate — you tell the truth and hope you’ll stand out among the fakers who are also interviewing. 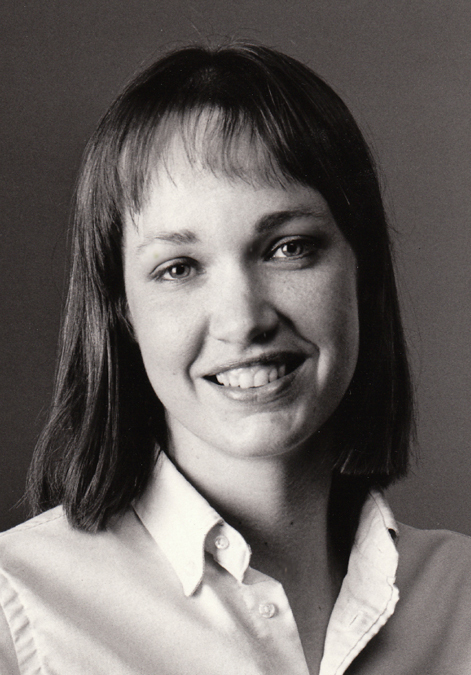 Carol Worthington-Levy c. 1984 – during my first year as a direct marketing creative. There is a shortage of integrity when it comes to interviewing for jobs, and creatives are not alone in this, but we’re claiming to be creative — so we should be able to develop a more creative strategy to get a job! I can’t say I’m a bona fide authority on this, but I HAVE gotten my foot in the door a few different ways that I’ve been told were worth sharing in this forum. Now, I am not an ivy league graduate or even a grad of a private university. I went to a state university of 12,000 out in western Pennsylvania and my final degree was not in copywriting or design or art direction — it was in fine arts and teaching. There were times when I wondered how in hell I’d get into advertising. Here are some of the things I did that proved helpful for me to get not only my full time jobs, but also, eventually, a vibrant freelance career. 1. Learn specific skills outside of your scholastic environment. Beginners need examples of their work. But work done in a classroom has limited appeal, often being irrelevant. We rarely graduate with a skillset that makes us ready to walk into an agency unless we happen to be a grad of a place like Art Center or RISD. So after my first 2 or 3 unsuccessful interviews, I realized that I was missing some essential skills to work professionally in the field of design. A conversation with a friend opened a door — his stepfather was representing a company that had a four-book-course on doing layout for advertising. He GAVE me a set — I will always appreciate his generosity, and I still have the books as a memento of an important step in my career! Much of this was very new for me. So I paged through the lessons in the books and learned how to hand-letter and lay out ads the way an agency would. This did not actually take much time to learn! I really worked at it, with the goal of filling a portfolio with quality examples – just enough to show a potential employer that I knew how to do it, and was willing to work hard. From there, I looked in magazines for ads that I thought were missing the mark. And starting from scratch, I redid about 10 of them, writing my own headlines, drawing marker comps and using techniques i had learned from the books. When I next interviewed, I was very clear with my interviewer that I had not been trained in this specific field, so I self-trained using a great course, and then I developed these concepts as new options. I even showed the original ads so they could see I hadn’t copied anything from the ad. By building my own portfolio as I did, potential employers could see that I wasn’t a whiner and I wasn’t afraid to work hard. And they could also see how I liked doing this work. They were impressed, and I got a job quickly after that, as a junior… just starting and a crap salary … but so grateful to finally have my foot in the door! 2. Listen, ask questions, and accept constructive critique. In addition to showing the examples (now, my portfolio) to new interviews, I called one of the folks who had interviewed me before, who had very kindly told me that I was missing these skills, and he allowed me to show him what I’d done. While he’d already hired someone, he assured me that I was ready and was proud that I’d used his critique wisely. I had asked this potential employer specific questions about why he didn’t feel I was ready (when I was in the interview) — and he provided it! So while he did, I listened and came back later to show I’d listened. He was impressed enough that he referred me to another art director for an interview! 3. Don’t dwell on your old examples. If you were lucky enough to be trained in your creative field, It’s worth it to keep and show some assignments you had for your first interviews, but after your first job, put it away! Interviewers want to see real work. If you have work that’s over ten years old in your portfolio, you probably should remove it before going out again. It looks odd to employers to see old stuff, and it requires too much explaining. Often it just looks old, and employers don’t like that. 4. A foot in the door is great — but will a toe do the job? Connect with a company like Aquent or CreativeGroup, who specialize in employment of part time or freelance creatives. If you believe your days are numbered at your current job, it’s worth it to go through the process of qualifying before you’re without a job, because you’re more confident and more attractive as someone who is working. Accept assignments that are short term or freelance, then perform your stuff. Often they continue your assignments until it makes sense for them to just hire you on full time. Why is this a popular resource for agencies? It’s an easy way for agencies and businesses to ‘test drive’, hire and try talent to see who fits into their organization best. Now that our nationalized healthcare situation is happening, you can work like this and still have health insurance. All over the country there are professional organizations that meet monthly or quarterly, and sometimes even weekly, Local branches of the DMA and the Advertising club are typical. Despite the cost of the meetings, plan to go to meetings, get there early, put on a smile and work the room. Ask questions of other people – find out what kind of biz they have etc. Make friends, and you’ll meet potential clients. If there is a BMA – business marketers association – those meetings can be fun and it’s rare to find a creative coming to the meetings. But these people need love (and great creative) too! The bottom line is, keep your integrity, don’t feel desperate enough to show work you didn’t do or exaggerate. Instead, show them what a go-getter you are through some of these suggestions. Persevere, keep an open mind, and eventually you will find work you really enjoy. You might end up moving from job to job more than you may like…. but remember, it’s all part of the adventure of developing a career! And wherever you go, there is something you can learn from someone there.